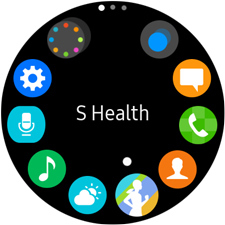 Your Gear S3 can encourage you to incorporate healthy movement into your day by monitoring your activity level 24 hours a day. If you are walking or running, it will urge you to keep it up. If you have been inactive for more than 50 minutes, it will remind you to move. Warning: The 24-hour activity tracker is intended only for leisure, well-being, and fitness purposes. It is not intended for medical use. Before using this feature, read the instructions carefully. 3. If this is your first time using the app, touch START to begin tracking your activity. Note: If you have not set up S Health before, you may want to set up your profile with your gender, height, and weight to get the most accurate calorie calculations. 4. 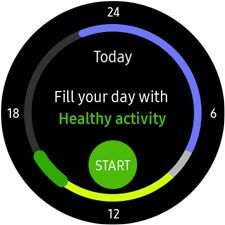 To view your activity throughout the day, from the Watch screen, rotate the bezel to the 24-hour activity tracker widget. Touch the screen to see a breakdown of your activities. 5. S Health shows your current activity. Rotate the bezel to see how long you performed each activity. 6. 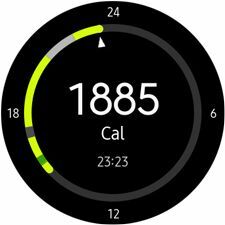 Continue to rotate the bezel counterclockwise to view data for previous days. 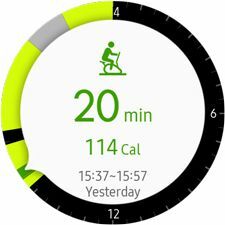 You can rotate through each activity, including workouts and heart rate recordings.